GWAAC are delighted to have received over £14,000 from independent family-owned Dorset brewer, Hall & Woodhouse. We were chosen along with seven other local air ambulances as the Hall & Woodhouse charity partnership from 2018 – 2020. 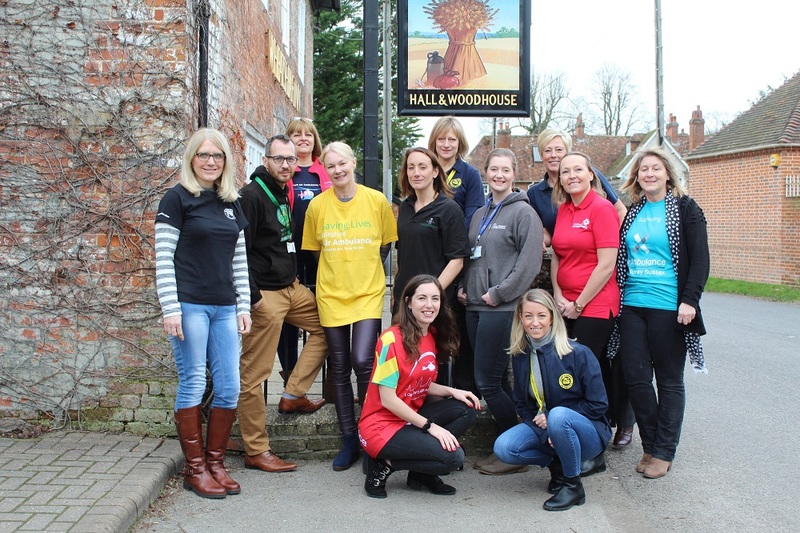 With 52 pubs across the South raising money for local air ambulances, including GWAAC, Devon, Dorset and Somerset, Hampshire and Isle of Wight, Kent Surrey Sussex, London, Thames Valley and Wiltshire, they have raised a huge £114,287 to be split equally between the charities so far. Team members of the company have dedicated their time to fundraising, from quiz nights to sponsored events and family fun days. In July 2018, six H & W team members took on a gruelling 18-hour 58km hike along the Jurassic Coast, raising £8,000 for the partnership. Lucinda Gray, Company Charity Champion of Hall & Woodhouse, said: “We are absolutely thrilled to have raised such a tremendous amount for the local air ambulances. Last year we set our fundraising target at £100,000 for the year and are proud to have smashed it. Within GWAAC’s region, Hall and Woodhouse Bath, Hall & Woodhouse Portishead and The Boathouse in Bath have all raised funds for the charity partnership. Despite 2018 being the charity’s busiest year to date, attending to 1,887 missions, GWAAC receive no day-to-day funding from the local government, relying solely on generous donations and the support of the local community.